Need an extra set of hands while stenciling? Try some magnets! Sold by the dozen, these 1/2" mag.. THE NEW STENCIL GENIE HAS A SLEEK NEW EASY TO CLEAN FRAME AND A STRONGER ADHESIVE TO HOLD IN THOSE M.. 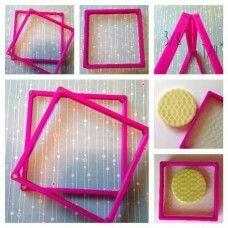 Introducing the Cookie Countess Stencil Scraper! This is the perfect tool for stenciling with ro..